Hang with Impractical Jokers writer John Szeluga and artist/Wahoo Skiffle Crazies member Chris Sorrentino for hilarious uncensored booze-fueled conversations between two nerdy dirty dads. The guys drink some coquito while talking about Christmas, pregnancy, The Rabbit Test, Junior, One Flew Over the Cuckoo's Nest, Throw Momma From the Train, Goonies, Twins, Thanksgiving, politics, new Netflix comedy specials, Mike Myers, SNL movies, Nick Williams, Impractical Jokers, and more! The Super Live Adventure Podcast is hosted by John Szeluga (Impractical Jokers) and Chris Sorrentino (Wahoo Skiffle Crazies). Previous episodes can be found on iTunes, Stitcher and SuperLiveAdventure.com. John will be performing at Valley Forge Casino on Friday, December 9th at 7:00 and 9:00 PM. Tickets are available at https://nightout.com. Download the free Podcast Source App or Amazon's Super Live Adventure App for Android to access bonus content. The Super Live Adventure theme was created by Ezra Donellan. Brought to you by Audible. Visit audibletrial.com/superliveadventure for a 30-day free trial and audiobook download. 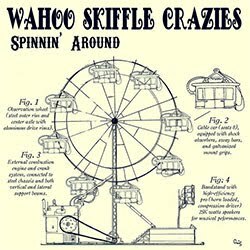 New Wahoo Skiffle Crazies album out now! Support the Super Live Adventure Podcast by shopping in our Amazon Store. Your first audiobook is on us!